Vending machines have come a long way since the first coin-operated one was introduced in 1883, in London, England. In case you were wondering, the first vending machine dispensed postcards. I'm sure you can still find postcard vending machines; however, most vending machines today carry food and beverages options for our fast paced world. There have been many changes, particularly in the last few years for vending machines. Customers are looking for more options, healthier choices, and quick payment options. Watch my video, below, to see what's new in vending. In the electronic age, most people don't carry cash or coins at all times. Consumers are looking for immediate satisfaction and the ability to pay electronically. Vending machines now have the ability to accept cash, coin, card payments, or finger print accounts. Along with these options, Bernick's is constantly growing with technology to meet the needs of consumers. With the changing demographics of work environments, there is a want for different options. To accommodate these preferences, vending companies are offering a wider variety of products including healthier options such as granola bars, rice cakes, tea, and kombucha. There is also a new trend toward more high-quality meal options, which led to private labels offering fresh snacks and sandwiches that are continuously restocked. Staying up-to-date on the dietary and eating trends is critical to meeting the needs of consumers. Micro markets have been very successful in recent years. A micro market is a stand-alone, unattended vending location. Traditional vending machines hold food and beverage options with longer expiration dates. Today, with changing customer preferences, micro markets offer a broader selection of food and beverage. 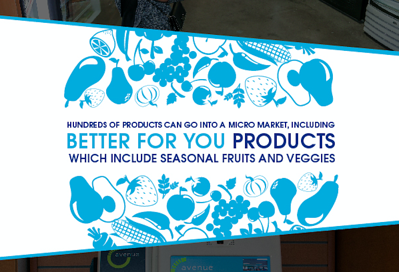 Micro markets also give your customers the ability to browse the shelves and coolers and read the nutrition label before making a purchase decision. To top it off, the kiosks offer multiple ways to pay and are open 24/7 to accommodate your consumers' preferences and schedules. Similar to micro markets, nano markets are ideal for smaller building locations. Nano markets provide similar food and beverage options for consumers, but use a tablet for payment versus a kiosk. Vending machines provide a treat at work, while options have changed over the years, the concept of providing a service has not. Bernick’s vending program offers consumers simple classic snacks, healthy choices, and handmade, locally prepared full-fledged meals.